Dog accidents can leave odors and stains behind on your carpet that aren't always easy to remove. Regular cleaning products won't remove this odor, but enzymatic cleaners can completely break down all traces of pet odor when used properly. You can also make a homemade cleaning solution to remove the stain and use vinegar to neutralize the the odor. Clean dog odors as quickly as possible to prevent the stain from setting into the carpet. You can locate the source of old pet odors on your carpet with a black light. Pick up any solid waste with paper towels and dispose of it. Place a few sheets of paper towels and newspaper on any wet stains. Weigh it down to absorb the moisture, changing them as needed until the carpet is barely damp. Blot up the stain with cool water on a cloth or towel. Rinse and blot the stain several times. Vacuum up any remaining moisture with a wet/dry vacuum, if possible. You can use an extraction carpet cleaner with plain water, but don't turn on the heat because it can set the odor. Spray the clean, dry areas of the carpet that were stained with enzymatic cleaner. Allow it to sit for a few minutes and blot it with a cloth or paper towels. Allow the carpet to dry completely. 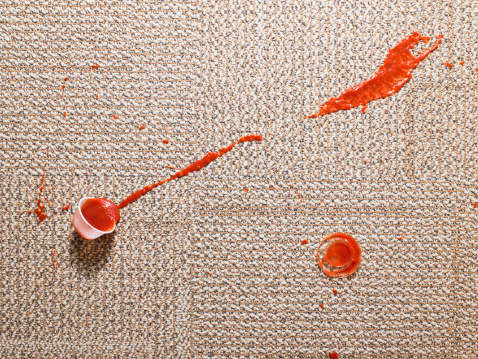 If any stains remain, apply a carpet stain remover and scrub or blot it to remove them. Remove any solid waste and dispose of it. Blot up any wet stains with layers of paper towels and newspaper to remove as much moisture as possible. Mix 1 teaspoon of dish detergent with 1 cup of room-temperature water. 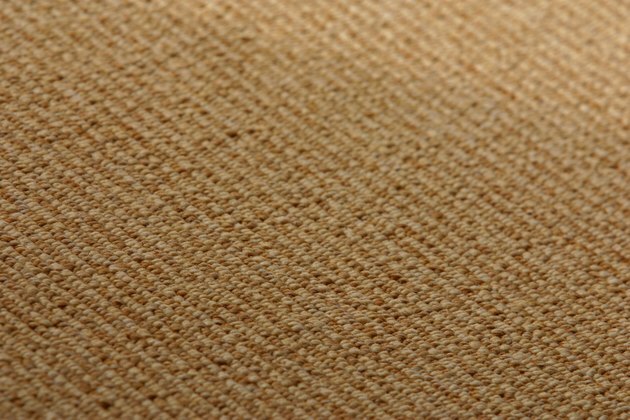 Apply the solution to the carpet with a cloth. Blot the stain thoroughly from the outside toward the center. Rinse the stain with cool water and press the carpet with a towel to absorb the moisture. Mix 1 ounce of white vinegar with 1 cup of water. Dampen a cloth with the vinegar solution and blot the carpet to remove any remaining odor and soap residue. Blot the carpet with a towel to remove as much moisture as possible and allow the carpet to air-dry. Can I Clean Carpet With Dishsoap?